Something tells me Rich Rod would have gotten along just fine in Tuscaloosa. West Virginia seems to be what the State of Alabama would be like if The Bama Fans of the Week happened to be running things in Montgomery. Airbrushed RVs for all! that elephant can walk on water....jesus must be a bammer fan! west virginia commercial equals bama nonsense?? makes perfect sense. hey...'member that time ole miss had a football team?? Water? I thought that was the blood of Big AL's fallen enemies. Gerry, it's February. Not much football to speak of. 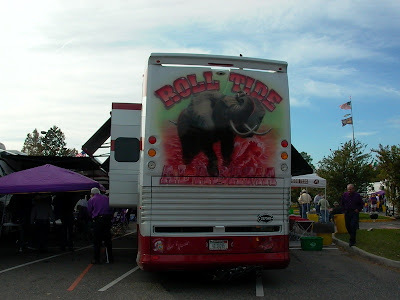 However, I get to enjoy Bama fans 365 days a year here in The Heart of Dixie. Anything else you'd like me to cover? Erik, I hope your job pays extremely well, or you're possibly looking at it as a stepping stone. Having previously lived in the Ozarks for eight years, I know what it's like to live behind enemy lines. You start to get nauseous every time you see red and white together on anything. And then I married a Sooner to top it off, but I have made strides in "converting" her. A post making fun of Alabama .....zzzzzzzzzzzzzz. At least mix it up. I check in 2 or 3 times a day. artiger, sometimes you just have to be an outsider to see how crazy/funny some things/places/families really are. What's that old sayin' about the frog and boiling water. It makes the observations a lot more interesting in most cases. Looks like "Miss Whataburger" needs to visit her nearest local franchise and order the #1 combo - large size.